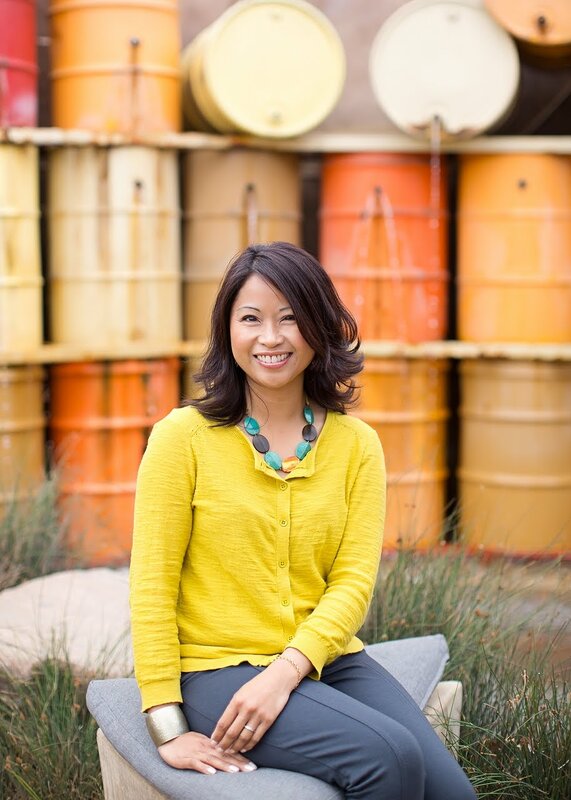 There is no shortage of home improvement projects to tackle in our beloved fixer upper, but one of the bigger interior projects still pending is the master bedroom and bathroom renovation. It will be an extensive undertaking that will require more planning and saving. Since that project is not in the immediate future, I decided to go ahead and freshen up our bedroom in the interim. Other than paint and new carpet, the room hasn't gotten any attention since we moved in three years ago. 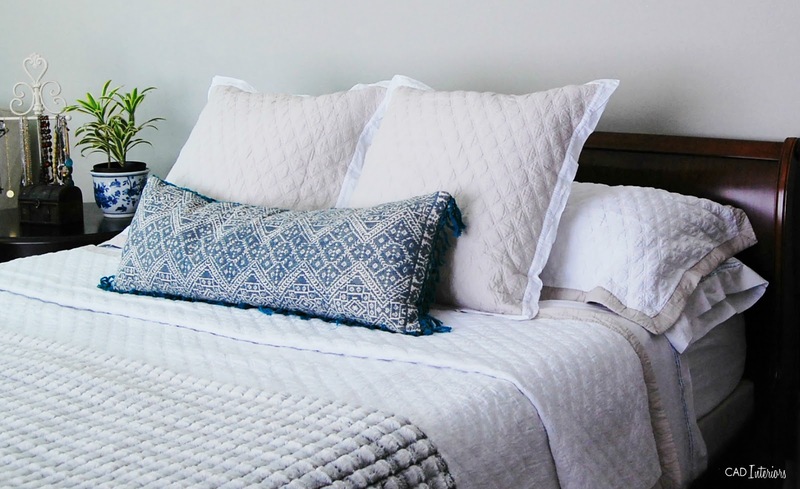 The focal point of any bedroom is the bed, so it made sense to start with refreshing the bed linens. The foundation of every well-dressed and comfortable bed starts with GREAT sheets. 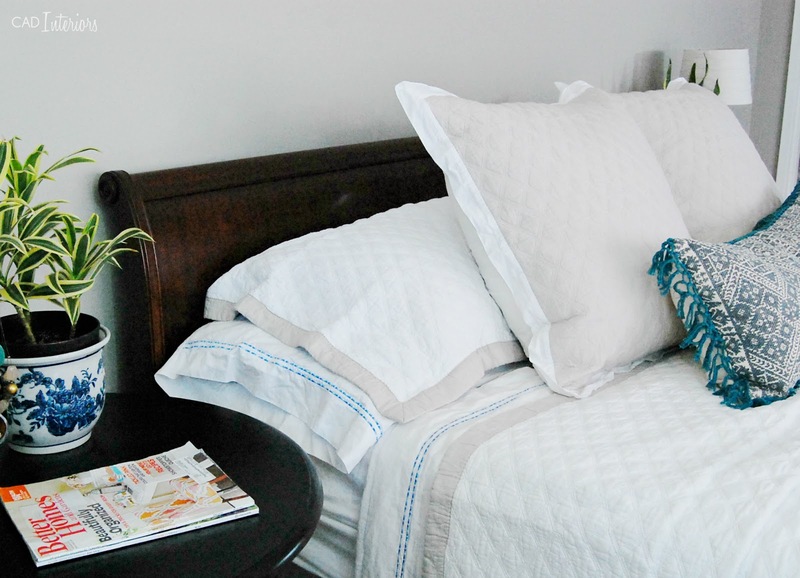 So when I came across Perfect Linens, I thought their European-made cotton sheets were worth trying out. We've been using the "Second Skin" Egyptian all-cotton sheets for the past month, and I must say, they are SUPERIOR quality! The sheets are soft, yet have "structure" to them. 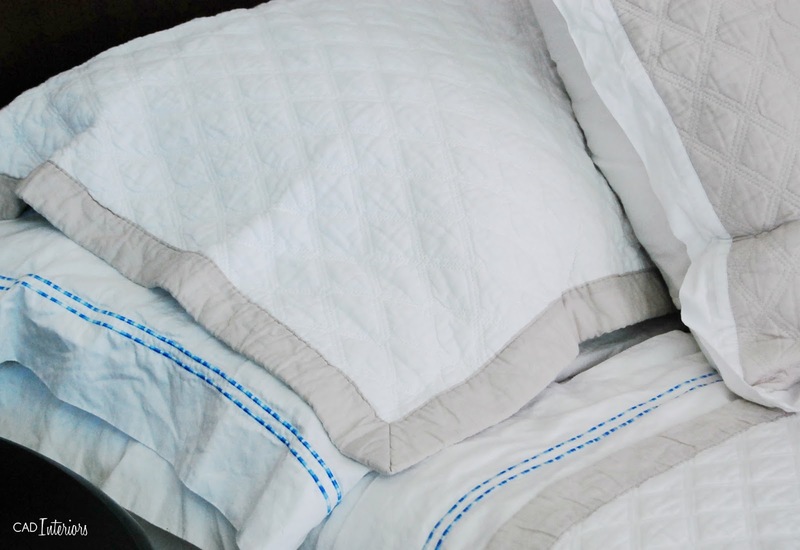 In the warmer summer months, I prefer dressing the bed with a quilt instead of a duvet. 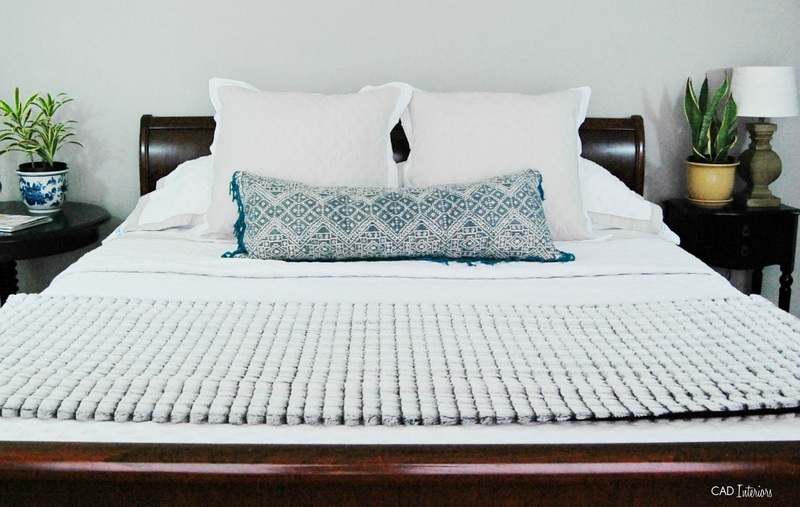 I love the quilted texture of this blanket and pillow sham ensemble against the cotton sheets. I've been searching for a lumbar bolster for back support when I'm reading in bed. I luckily stumbled upon one for a great price - $15 for both the insert and cover! 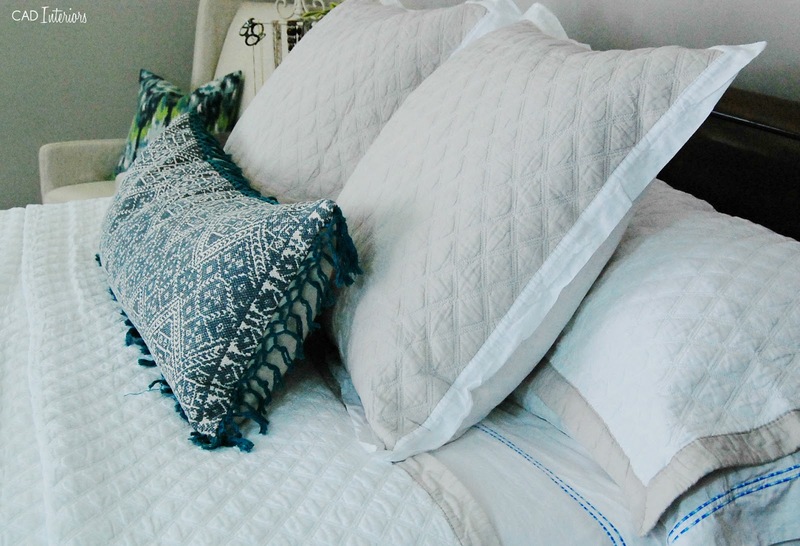 It added a fun pop of blue and teal to the neutral bedding. The pattern also loosely mimics the diamond pattern of the quilt. That being said, all we've been sleeping under lately are the sheets. What has impressed me is that these sheets don't "cling" to your body whatsoever. They are super comfortable, and don't make you feel hot, cold, or muggy. 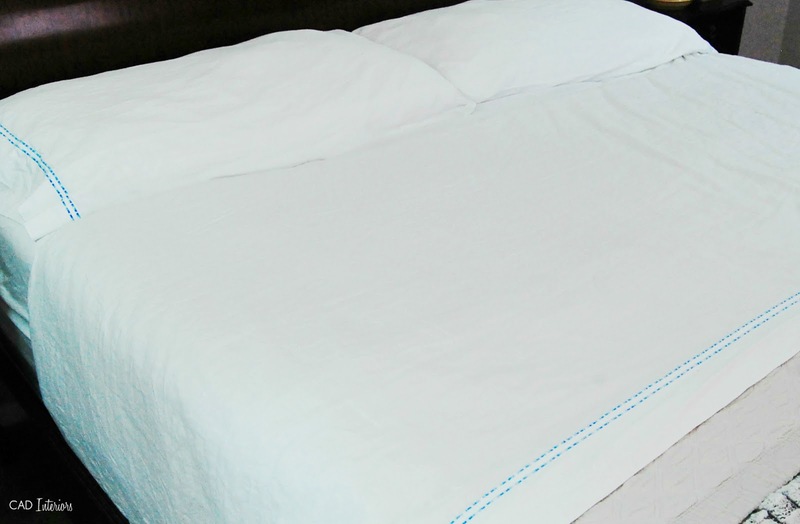 The sheets are made of 400-thread count pure-combed cotton, and seem perfectly suited to use year-round. The flat sheet is SO generously oversized. Look how far it folds down over our king-sized bed! The proportion of the fitted sheet is extremely deep too. You won't have a problem stretching it over the mattress. 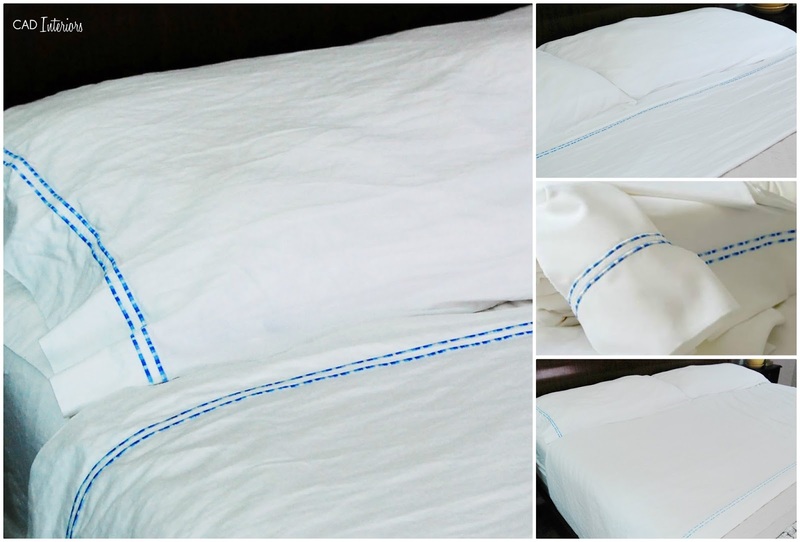 Both the pillowcases and flat sheet include a color-fast, stitched embroidery design. We have the "double blue stripe", but it is also available in other patterns. 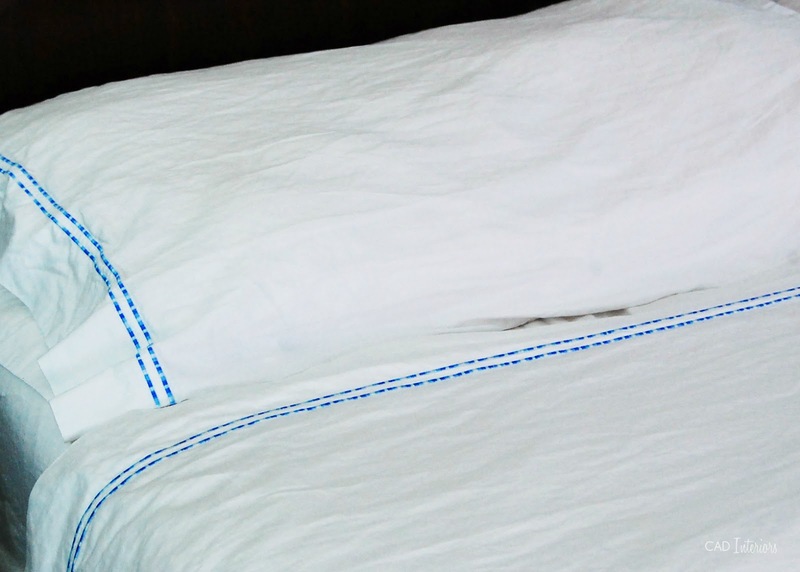 We washed these sheets several times to test how they would hold up, and they look and feel like new each time. 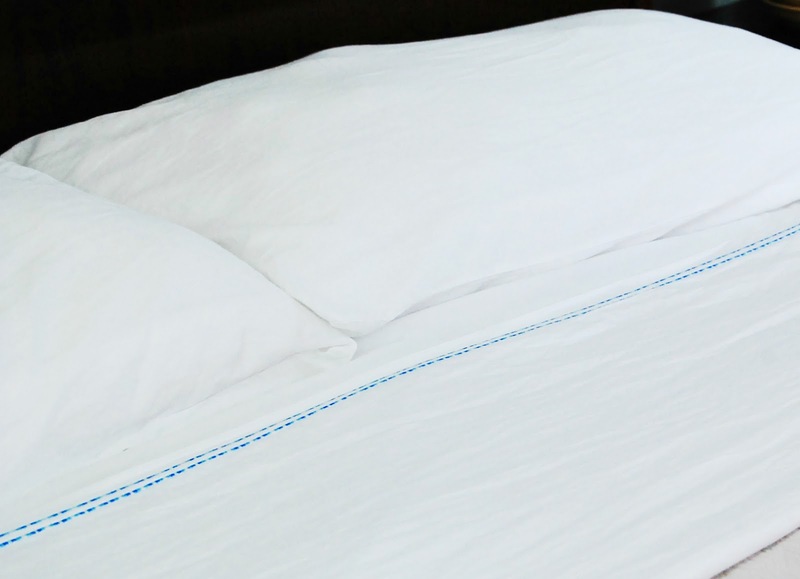 That's because Perfect Linens uses a special natural enzyme treatment process that ensures the sheets will remain permanently soft. 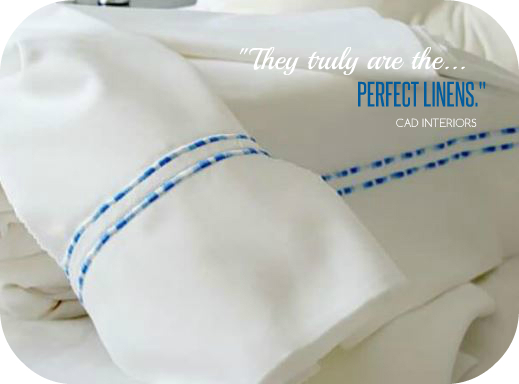 These sheets are truly the "perfect linens"! You can get your own set of sheets and take advantage of a special 15% DISCOUNT that Perfect Linens is kindly offering my readers. Follow this link, then use CAD15 at checkout to take 15% off your entire purchase! This post is in collaboration with Perfect Linens, but all opinions expressed are completely my own. Thank you for supporting the companies that support this blog. Love the bolster pillow, where did you find it?